I couldn't resist teaming this tangle Birdie Feet from Owl Loving April with the tangle Birds on a Wire. 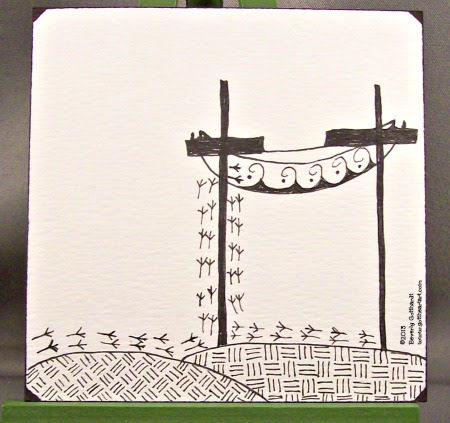 I did a tile very similar to this one with the Birds on a Wire, but on this one I added the feet and the grass. 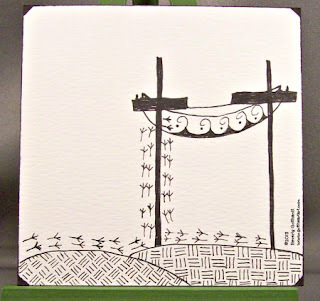 My tile is not the most elaborate so you need to click over and check out the other entrants take on this challenge. There are already some really neat tiles. Must have been a lot of fun drawing this! You are a genius and this is the perfect and I mean perfect tile! Clever tile, and also amusing. I like iet. Oh, what a cute idea! I love it! I love this! Made me giggle out loud. Nice touch to combine these two tangles.